Pemberton is one of Australia's newer wine regions, located in the South West of Western Australia. 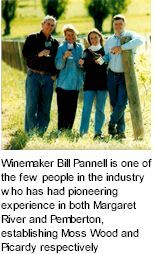 The first grapes were planted in 1977, with commercial plantings expanding throughout the 1980s. Pemberton is an excellent region for viticulture because of its combination of southern latitude and high altitude, which create a relatively cool climate. This provides the grapes with a sustained ripening period. Pemberton's loamy, gravel soils and cool climate will prove it to be one of the best regions in Australia for the growing of pinot noir and chardonnay. The region is also well suited to the production of refined Bordeaux style wines. Picardy was named after a region east of Paris. A wine merchant and family friend noted that many of the great wines and wine regions have names beginning with the letter P. Pomerol, Petrus, Pauillac and Pommard are examples. Picardy strives to continue this tradition of wine making quality and excellence. The viticulture approach at Picardy underpins the quality of the wines, as does the Burgundy heritage of the clones. The Picardy site was chosen for its high altitude and well-drained loam/gravel soils. The vines have been close planted to promote competition between vines and maximize root depth. The vines are trained low to enable them to use heat radiating from the gravely soils in the evenings. This effectively extends the duration of the growing and ripening time per day. The entire vineyard is leaf plucked, crop thinned, picked and pruned by hand. This approach to viticulture reflects the Pannell's philosophy of being hands-on in every facet of the vineyard, winery and wine distribution. One of the special clones of Pinot Noir being planted post-tissue cultureDuring Bill and Sandra's involvement in Burgundy in the 1980s, they became aware of a substantial clonal selection trial, which had been carried out for more than a decade. Several hundred selections of Pinot Noir and Chardonnay taken from many of the Domaines in Burgundy were trialled. Of these, four Chardonnay (76, 95, 96 and 277) and 3 Pinot Noir clones (114, 115 and 777) were selected. These clones were chosen on the basis of the quality of wine produced from them, rather than yield. Friends in Burgundy advised Bill and Sandra to plant a mix of all of the clones to increase the complexity of the resulting wines. Observations to date suggest that there is considerable variation among the four clones with respect to growth habits, bunch size, yields, flavour and wine structure. The Shiraz, Merlot, Cabernet Franc and Cabernet Sauvignon are also special selections, chosen with the same emphasis on quality in mind. Picardy wines are vintaged and bottled by the Pannell Family in their Pemberton winery, where their attention to detail and hands-on approach is reflected in the winery and wine-making. Picardy wine is produced in special tanks, designed by Bill and Dan, which can be used as open or closed fermenters. For example, they can be closed during cold maceration to prevent must oxidation, and opened for hand plunging during fermentation. All red wines are hand plunged to give softer extraction of tannins from the skins and seeds while still achieving maximum colour and flavour. These wines are then matured for twelve months in French oak barriques ranging from new to four years old. The Chardonnay is produced in a delicate, refined style in keeping with the great wines of Burgundy. It is barrel fermented and lees aged in French oak for ten months. The bottled wines are placed into wooden bins for 3 months, and later labelled and boxed. This allows exclusion of any leaking corks or low filled bottles, thereby further ensuring the quality of the product that you receive. In 1998, Bill and Sandra went on a fact-finding mission to Burgundy, in particular to find a small, high quality barrel producer. Burgundian winemakers recommended Tonellerie Meyrieux Fils, and close inspection found this French cooper shared Picardy's desire for maximum quality.